How to recover data from corrupted media? Let us describe each step in detail. 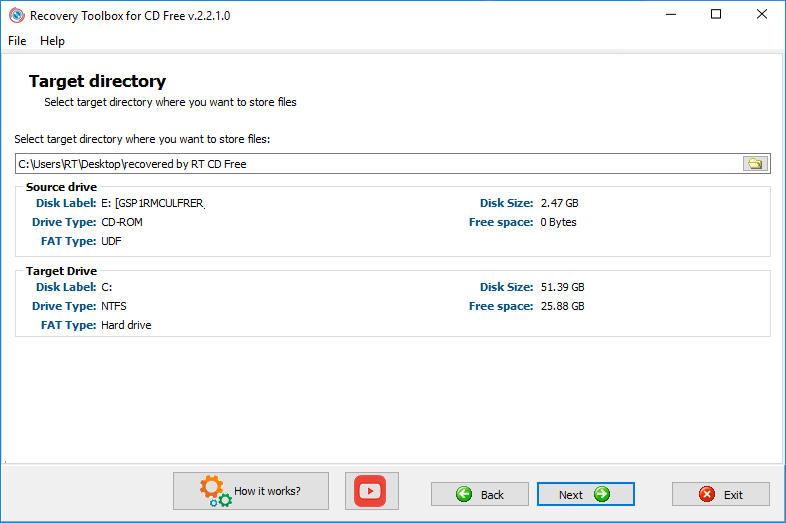 After you start Recovery Toolbox for CD Free, you will see the first page of the recovery wizard. This page shows the list of all available drives the tool can recover data from. You should select the necessary drive with a single mouse click or using arrow keys and click the Next button. Remember that until the very start of the data recovery process you can exit the program by clicking the Exit button and go back to the previous step by clicking the Back button after you open the second page of the program. After you click the Next button on the first page of the recovery wizard, you will see the page where you can select the disk and folder to save recovered data to. Note: information about the Target Drive is updated automatically after you change the drive selected for saving recovered data. After you select the folder you want to save the recovered data to and view information about the source and target drives, you should click the Next button and move to the next step. To select a file, just click the empty white checkbox next to the name of the file. It is possible to select both separate files and whole folders with all files inside them. You can also select all files on the drive for recovery. To do it, you should click the empty white checkbox to the left from the drive name (it will automatically select all files), which is the same as clicking the Check all button. You can cancel a click on the Check all button by clicking the Uncheck all button that will clear the selection of all files. The Save button will become available after you select at least one file for recovery. 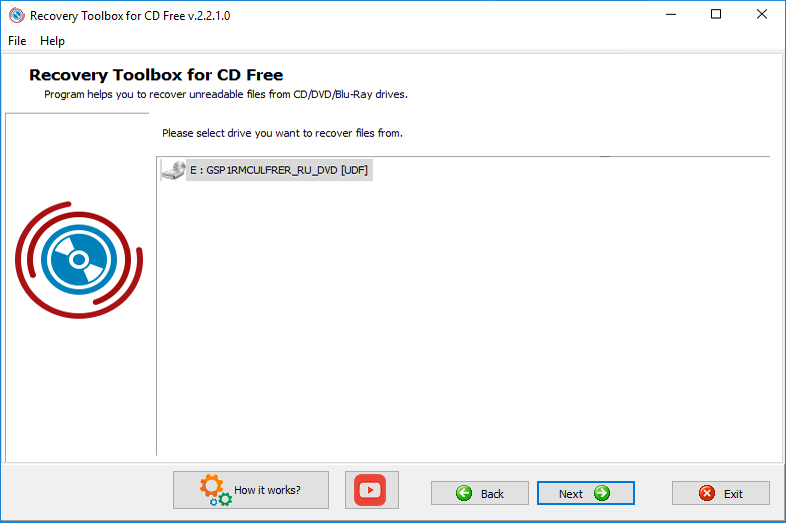 A click on the Save button will start the process of recovering the selected files and saving the recovered information to the specified folder. You can see the details of the recovery process in the following window. As soon as the data recovery process is complete, the program will open a window with the folder where the recovered data has been saved. That is all! The recovery process is complete! You can click the Exit button. All windows in the wizard of Recovery Toolbox for CD Free have the main menu. You can always exit the program not only using the Exit button, but also by selecting the File | Exit menu item. The Help menu has three items. A click on the Recovery Toolbox for CD Free Help item will open this page in your default browser; the Recovery Toolbox for CD Free on the Web item will open the Recovery Toolbox for CD Free web page in your browser. A click on the About item will open a dialog box with information about the program and its developer.